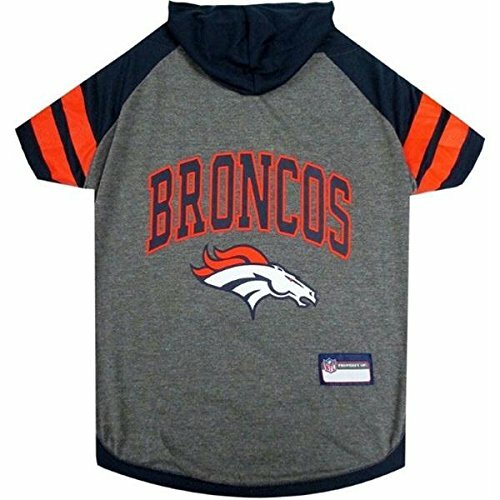 Get ready for Game-Day with this officially NFL licensed pet Hoodie Tee Shirt. This sporty Hoodie Tee Shirt features raglan sleeves a screen printed Team Logo and Team Name in vibrant team colors and a sewn on Jock Tag for personalization. Designed with a Velcro neck closure and with an easy fit stretch front panel and band bottom to fit your pet with ease and maximum comfort. Contrast color sporty over lock stitching is detailed on the neck and bottom. BACK 14"-18"; CHEST 21"-24"; NECK 10"-12.5"